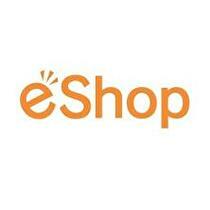 Improvements to the store are indicated by the eShop team. The Nintendo eShop will not be available just before the system update hits according to a news bite on the European version of the store. It also mentions that new features will be available once the update is performed and players return to the eShop. Players hoping to play classic Game Boy Advance games on the 3DS might have to wait a little... UPDATE: or not. The free Game Boy Advance games promised to early adopters of the 3DS (known as Ambassadors) may be delayed into 2012, according to information from conflicting Nintendo of Europe pages. A special limited edition bundle will come with Nintendo's new peripheral. Capcom's Resident Evil: Revelations will come optionally bundled with the Circle Pad Pro when it hits Europe in January 2012. A press release released by Nintendo (who is distributing the game in Europe) states: "Resident Evil: Revelations will be available to players across Europe as a stand alone game and as a special limited edition bundle which also includes the new Circle Pad Pro accessory." The Nintendo Experience is once again hosting a gaming gathering in Melbourne. The launch of Mario Kart 7 is being celebrated at The Nintendo Experience, the upstairs loft and gaming galleria at EB Games on Swanston St. in Melbourne. The partnership with Retro is detailed, and a Mario Kart 7 feature was originally meant for the 3DS as a whole. 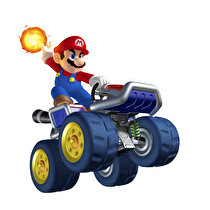 The latest Iwata Asks, hosted by Nintendo President Satoru Iwata, has been released, this time focusing on the upcoming Mario Kart 7 for the 3DS. This time, the roundtable discussion features the members of Nintendo EAD, which include Mario Kart 7's producer Konno, art director Morimoto, lead artists on karts and characters Ishikawa and Ichijo, coordinator between EAD and Retro. The BIT.TRIP studio is possibly working on the new console as we speak. Gaijin Games, best known for the BIT.TRIP series, might have gotten their hands on Nintendo's Wii U console. A vague hint was dropped on the company's Twitter page earlier today. My brand new copy of WWE All-Stars for 3DS came with an unexpected surprise. Club Nintendo points, previously reserved for first party Nintendo-published games, are now being included on select third party titles in North America. Both WWE All-Stars and Sonic Generations (published by THQ and Sega respectively) for Nintendo 3DS include codes that are redeemable for 30 Club Nintendo points. Super Mario 3D Land and 3DS sales also soar. Nintendo of America President Reggie Fils-Aime revealed some impressive statistics regarding the sales of the Nintendo 3DS as well as two of their holiday titles in a recent USA Today interview. The Legend of Zelda: Skyward Sword, released last week, sold an impressive 535,000 copies. According to Fils-Aime, this makes Skyward Sword the fastest selling Zelda title of all time. A new LEGO Batman game may be in development featuring other DC characters. A recently revealed image is supposedly teasing Travellers Tales' newest LEGO game, LEGO Batman 2: DC Super Heroes. Get the pink 3DS bundled with Nintendogs + Cats next month. In a recent press release, Nintendo revealed that the pink 3DS will launch in North America on December 4, 2011. 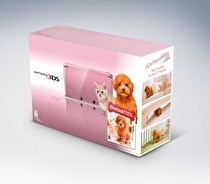 The pink 3DS will be bundled with one of two different versions of Nintendogs + Cats. One version will include Nintendogs + Cats: French Bulldog and New Friends while the other is bundled with Nintendogs + Cats: Toy Poodle and New Friends. Both versions of the bundle will retail for $169.99. You will have to wait a bit longer before you can record 3D videos. 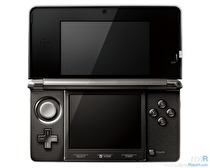 Nintendo announced a delay for the Nintendo 3DS update, which was originally planned for tomorrow. This was indicated through a notice on their official 3DS website. The update will add new functionality and games to the StreetPass Mii Plaza as well as the ability to record and playback 3D video content. It will also allow players to finally transfer their data between units of the handheld. The more you hear of it, the more unfamiliar it sounds. Details on Kiki-trick, a Nintendo-published Wii title, have been revealed by several retailers. Nintendo announced the game quietly at the Nintendo Direct Conference back in October. Very little was known about the game, but as its release date approaches, details are appearing on game shop sites. Japanese players can download this platformer next week. Next week's Japanese 3DS Virtual Console title is the Sunsoft-developed Game Boy title Trip World. This platformer puts players in control of the rabbit-like creature Yacopu. 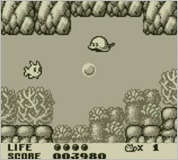 Players join Yacopu as he swims underwater, takes to the skies, or walks across five different stages, each of which includes its own boss fight. The enemies in Trip World are not aggressive and will not deal damage unless provoked by the player. A look at the animation and mechanics of the 3DS music game. Sega released four new videos for its upcoming 3DS game, Rhythm Thief & the Emperor's Treasure (also known as Rhythm Thief R). Three of the videos focus on the game's animation and story component, with the fourth highlighting the game's rhythm-based gameplay. Rhythm Thief is slated for release in early 2012. Metroid II arrives with some other downloadable goodies, but the Wii Virtual Console is abandoned once again. 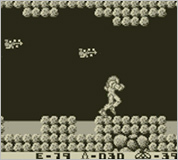 As reported earlier this week, the 3DS eShop received Metroid II: Return of Samus. Other downloadable titles this week included a WiiWare game and two titles available on both the DSiWare and 3DS eShop services. 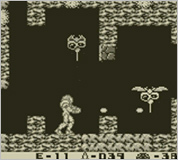 Metroid II: Return of Samus, a 3DS eShop game, is the sequel to the NES game Metroid. Players can once again join Samus as she fights off the Metroid scourge, for $3.99. The digital store keeping its momentum going with another interesting release. Zen Studio's Zen Pinball 3D will be available next week on the European Nintendo eShop. This information is confirmed through a newly added entry on the digital store. The game offers four different tables, each with their own attributes and set pieces for a unique pinball experience. You can also duke it out online and locally with up to four players, post your scores on online leaderboards and look at some shiny 3D models. Renegade Kid's first eShop release gets a new trailer. Renegade Kid has released a new trailer for their upcoming eShop platformer, Mutant Mudds. The trailer introduces some new areas and enemies. Mutant Mudds is due out on the eShop by the end of this year. Side-scrolling action title set to release before the end of the year. Samurai Sword Destiny, an action side-scroller from UFO Interactive Games, is coming to the 3DS eShop before the end of this year. In the game, you control a female samurai on a quest to bring her missing older brother home. Along the way she can pick up dozens of upgrades to enhance her fighting abilities and help her take down the forces that stand in her path. Shin'en's Nanostray follow-up was supposed to come out today. Nano Assault, which was set for a November 22 release, isn't coming out quite yet, according to publisher Majesco. "The game was pushed back and is not available yet," a representative from the publisher said today. Developed by Shin'en, Nano Assault is a shoot-'em-up for 3DS. It is one of seven 3DS games Majesco is publishing this holiday season. Also, Pushmo set for December, and Sakura Samurai is coming in January. Metroid II: Return of Samus is coming to 3DS Virtual Console on Thursday, and two new original eShop titles are on the way soon, according to a Nintendo press release. We already reported on Metroid II's European release, which was also confirmed via press release this morning. Metroid II originally came out in North America almost exactly 20 years ago.